Technically advanced x-ray machines offer reduced patient exposure. We are the only practice in Suffolk to have invested in this essential state of art technology. This allows Gold Standard Implant placement and wisdom tooth treatment to be carried out at our Aldeburgh site. The 3D technology helps us to be much more precise avoiding unnecessary damage to adjacent vital structures. We are pleased to announce the arrival of our new digital imaging system. This has revolutionised the quality of our X rays. We can see things now that may have been overlooked with traditional x ray systems. For example early cavities or hidden cracks in the tooth. Much, much lower dose – but with better resolution than standard old style x rays. The images are immediate and saved on the computer screen with no time to wait for development. They can be emailed for specialist consultant opinion with no loss of quality. Schick offers high quality, state-of-the art imagery offering many innovative features. The razor-sharp intraoral x-ray images provide our dentists with the latest technology in aiding fast and accurate diagnosis and treatment planning. This advanced system for general dentistry, endodontics, periodontics or restorative dentistry is a must for any modern dental practice. A welcome addition to the Schick Modular Platform. 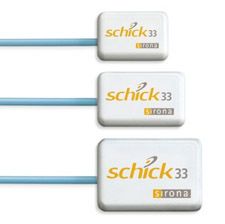 Featuring the Schick modular platform’s unique interchangeable cable technology and remote module — paired with our powerfully simple imaging software — Schick 33 gives you an unprecedented level of control over your high-quality digital images.